Johnny Mercer's imprint is all over The Great American Songbook. He's best known for writing the lyrics to more than a thousand songs- for Broadway, for Tin Pan Alley, for film, and for pop singers. Johnny Mercer's imprint also is all over Savannah, GA., the verdant and historic city where he was born. 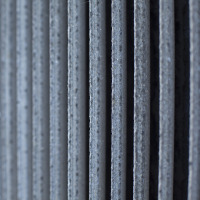 Any place live music is performed, Mercer's material seeps out at listeners. You might even hear Moon River" a few times a night at a piano bar or restaurant. (The tune, with music by Henry Mancini and lyrics by Mercer, won Grammy and Academy Awards in 1962). Heck, there's even a brew pub in Savannah named after the song, which premiered in the 1961 film Breakfast at Tiffany's. 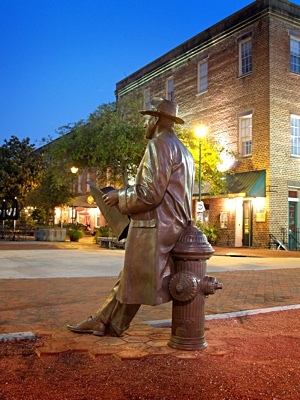 A sculpture of Johnny Mercer, leaning on a fire hydrant reading a newspaper, was unveiled on November 18, 2009, which would have been his 100th birthday. The life-size tribute, at the edge of Ellis Square, is just a stone's throw away from artist Susie Chisholm's studio in the city's arts-vibrant City Market area. Galleries and studios abound, including one featuring A.J. Seidl's jazz-themed paintings. Mercer's most frequent collaborators over this career included composers Harold Arlen, Hoagy Carmichael, Henry Mancini and, in his later years, Barry Manilow. He was a lyric genius. Tunes with his imprint included Skylark," The Midnight Sun," Early Autumn," Tangerine," Satin Doll," And When October Goes" and One For My Baby (and One More For the Road)." Mercer penned both music and lyrics for Dream" and Something's Gotta Give," among others.